I appreciate the opportunity I have to help make a positive difference in our constituency, city and province. I enjoy visiting with you on your doorsteps and events in and around our community. Your thoughts, ideas and feedback make a big difference in keeping me informed on the issues that matter to you. 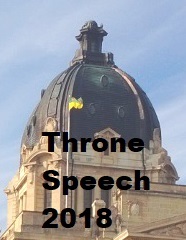 If you would like me to recognize anyone or have your event mentioned in this newsletter, please don't hesitate to call our office at 306.651.7100 or email ken.cheveldayoff.mla@sasktel.net. Your opinions are important and your letters, emails, and phone calls on any issues relating to the provincial government are welcomed.